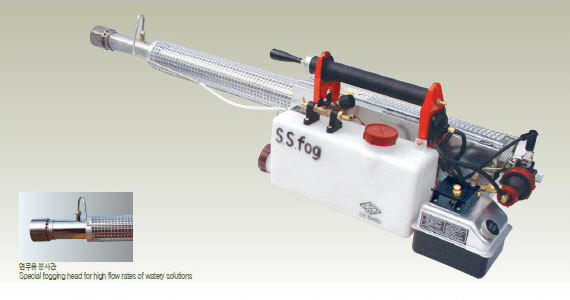 DINSO HOLDING offers you a unique product called Agriculture Pest Control Portable fogging machine. It can be used indoors or outdoors to produce a dense fog of insecticide which is used to eliminate plant deseases and insect pests. Outdoors and under correct weather conditioning fog can be dispersed over an infested area most effectively with a minimum of environmental contamination. This can provide a safe method of controlling insect pests over a large area. Electric Agriculture Pest Control Portable fogging machine is used to treat large volumes of space with cold fog rapidly and economically. It is particularly useful in many cases especially in purification plants where audits flies are a menace. It is also helpful as well as for the disinfection of stables, chicken houses etc., with formalin. Portable engine fogging machine driven by 4-cycle gasoline engine, is a portable ultra low-volume (ULV) cold fog generator to control flying insect pests and vectors of diseases by applying insecticides. Over 90% of particle size sprayed from the unit are below 20, thus creating great effects even with a small amount of chemical. Buy Wholesale Syringes and Needles Lowest Price!